Ragged Soul’s excellent blog about her personal journey with bipolar disorder. I was diagnosed with bipolar 1 disorder almost a year ago. I was hospitalized for nearly a month in the psych ward. I had a complete psychotic break. I had hallucinations and grandiose thoughts – a classic manic episode. I started a blog just before my episode went into full swing. My writings in the days leading up to my hospitalization reveal a bit of what was going on in my head at the time. I think a lot of what I had to say was real, it was true. I still believe most of what I had to say. So, what does it all mean? 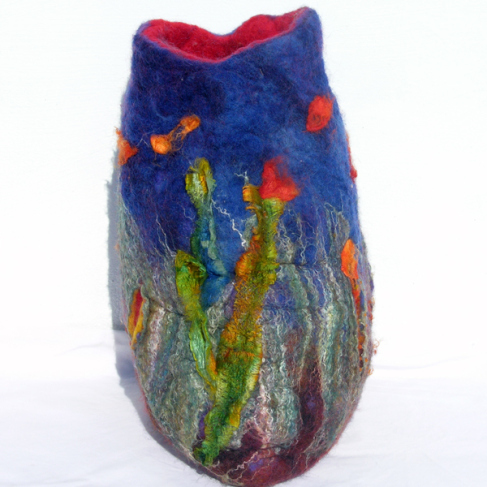 My wife, Carole, is producing some amazing textile work. Lately, a lot with felting. Why not drop over to her blog and check out her projects, and you’ll also see how some of them are created. You’ll also find more about her work, including lots of beautiful work for sale, through her Bagsalicious Facebook page. 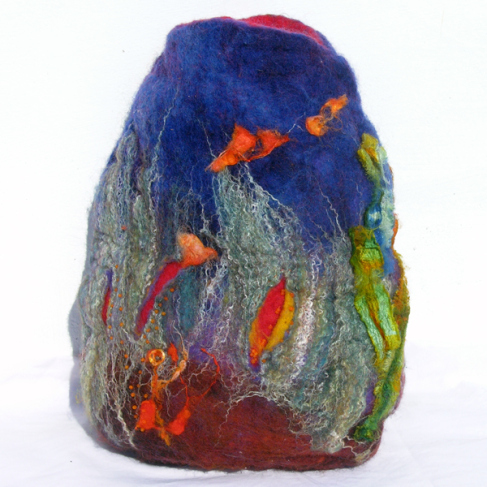 All those gorgeous, rich, jewel-like, dyed fibres came together to create this 12″ high felted pod, but it is calling out to me to become a handbag. I hope I did the fibres justice and kept their beauty.